We are not signposted or advertised. We want to keep our hostel a special place exclusively for Adventurers…..
We are listed on Maps.me and iOverlander. DONT FOLLOW GOOGLE MAPS – our road is not listed on their maps. We are located in the heart of the coffee district in a beautiful town called Filandia, in the department of Quindio. We are 30minutes drive from Armenia, 30minutes drive from Pereira and 15minutes drive from Salento in your own vehicle. Coming from Filandia town, head towards the huge wooden viewing Mirador (looks like a big spaceship). Take the gravel track on the right hand side directly before the Mirador. We are about 1.5km down this track and are the only house with 2 floors! 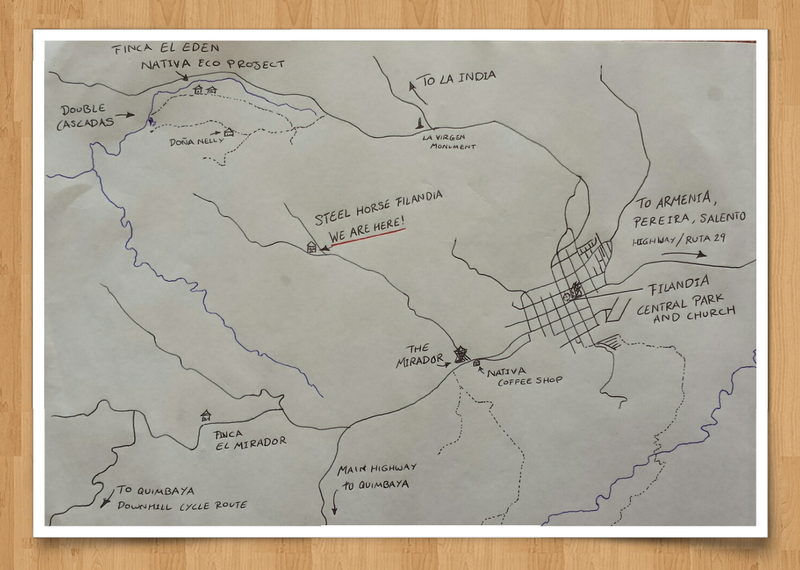 Map of our location, Finca Santa Rita, Vereda Argenzul, Filandia. Once you reach Filandia’s main square you can either walk (30minutes) or take a Willy’s jeep directly to our door (10 minutes) for 15,000 pesos during the day or 20,000 pesos at night, (the price is for thewhole jeep regardless of the number of people). Ask the driver to take you to Finca Santa Rita, Vereda Argenzul (pronounced Ar-hen-sool). If walking, take the last road on the right, 100m before the mirador. We are are 1km walk down this gravel road and are easy to find as are the only house with two floors. The majority of the walk is downhill. Filandia is a very quiet and safe town and our neighbours are all very friendly, please smile and say hello to them! NEW: there is a new Willy’s jeep service coming directly from Salento to Filandia. The service runs on an hourly basis throughout the day and is subsidised so will only cost you around 6000 pesos. Catch a bus from Salento to Armenia, but get off at Los flores (tell your driver your destination is Filandia and he will tell you where you need to get off. Cross over the highway (be quick and carefull) there is a flower shop on the other side (the name is Los Flores) from here you can catch a bus heading for Filandia. The total cost of both busses is $6,000 pesos per person. Catch a bus to Filandia from the main bus station or outside of “Central Comercial Bolivar” a shopping centre on the corner of calle 2 and carrera 14. Busses leave every 30 to 40 minutes on weekdays and saturdays (every 1.5 hours on sundays) and take 45 minutes. The price is around $3000. Busses leave from Pereira’s central bus station every hour. The journey takes approximately 45minutes and costs around $6000. Take a Bus~ Busses run regularly (every 40minutes)from Bogota to Armenia and cost around 50,000 to 65,000 cop. The bus will drop you directly at Armenias main bus terminal and from there you can catch another, smaller bus to Filandia. Alternatively take a flight~ Internal flights in Colombia are good quality and reliable. We recommend flying to Pereira as the airport is larger and flights more regular and are lower cost than flying to Armenia. Flights only take 1hour (air time) and, depending on the season, flights cost around 100,000 to 300,000cop. Once in Pereira you can either take a bus or a taxi direct to our farm for around 120,000 cop.